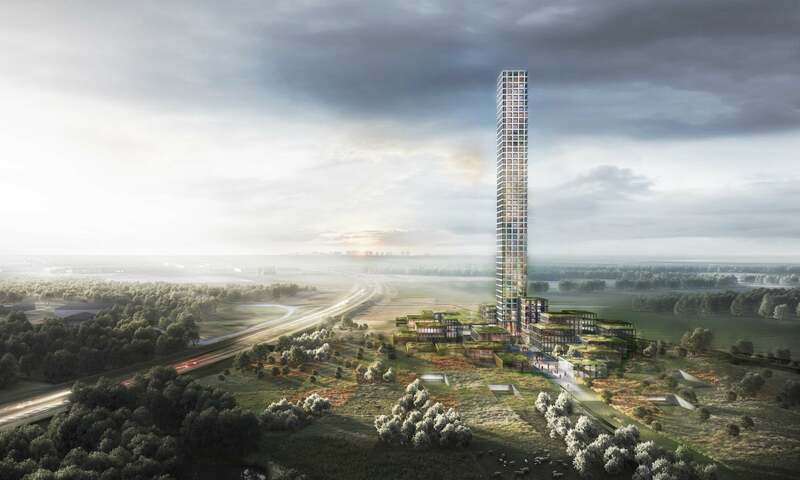 A 1050-foot-tall tower reminiscent of New York’s 432 Park could be Western Europe’s next tallest (occupiable) building—and it could be dropped into a rural Danish village of 7,000 people. The decision to build Bestseller Tower in Brande, where the building would be visible from 37 miles away in every direction, may seem counterintuitive at first—but Brande is also where the international fast-fashion company Bestseller is headquartered. To boot, it’s also the hometown of Bestseller’s founder and Denmark’s richest man, Anders Holch Povlsen. Danish firm Dorte Mandrup, no stranger to landmark projects throughout Europe, is the designer behind Bestseller Tower and has chosen a strong grid facade, as opposed to a more delicate glass curtain wall that could have disappeared into the surrounding countryside. The building will contain offices for the fashion company, a hotel, and conference spaces, while a “village” of glassy, greenery-topped retail pavilions at the tower’s base are expected to display Bestseller’s numerous clothing brands. Although Bestseller Tower will top out at over 1,000 feet, rivaling the Eiffel Tower, as planned it will only be 45 stories. Assuming the building won’t be using construction tricks such as including height-boosting mechanical voids, that means each floor will reach a whopping 23-feet-tall on average. Surprisingly, the tower isn’t facing much opposition in Brande, at least on the surface. The town council voted to approve the project last month and construction will begin this year, putting the tower on track to meet a 2023 opening. That approval is likely why the project is back in the news cycle, as plans were originally unveiled back in 2017.